9. Factors and Va­riab­les Influen­cing Mortga­ge Fi­nan­ce /mortga­ge-fi­nan­cing/factors-and-va­riab­les-influen­cing-mo.. 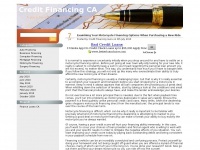 The web server used by Creditfinancing.ca is located near the city of Provo, USA and is run by Unified Layer. 25 other websites are located on this web server. Most of them are provided in the english language. The websites of Creditfinancing.ca are served by a Nginx server. Due to the robot information on the webpage, the following actions by webcrawlers are not allowed: archiving the website. All other actions by webcrawlers are allowed.